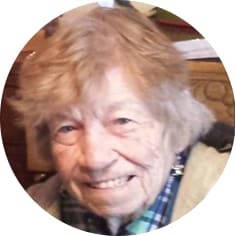 Della Catherine Weberg, aged 98 years of Moose Jaw, SK passed away peacefully on Sunday, March 24th, 2019. She was predeceased by her parents, Fred and Francis Robinson; husband, Harold; son, Jeff; brothers: Franklin, Steve, Lorne, Edward, and Alvin (Pete); and sister, Jean. Della will be lovingly remembered by her daughter, Jodee Nelson (John Wiebe) of Vernon, BC; granddaughter, Tiffany Gustavson; grandsons, Eric Nelson (Tanya Keatley) and Cameron Nelson; and great-granddaughter, Elissa Roth; all of Kelowna, BC; special friend, Patricia Puro; niece, Wanda Iuon (John Beck); as well as numerous nieces and nephews. Della was born in the Valor district, west of Assiniboia, SK. She attended Highland Valley and Weston schools. Della’s father did not want his girls spending their lives as dirt poor farm wives, so when Dell turned 21 he put them both on a train to Vancouver, where they found employment working at a plywood factory and picking fruit, as well as other odd jobs. She met her future husband at a social function and they married in 1948. They lived at a logging camp for a short period of time before relocating to land east of 100 Mile House, BC. Here, they cleared land, built a house and barn, and created a home for their two children. Dell was a true pioneer rancher of the Caribou. They later moved to Wembley, AB before finally relocating to Moose Jaw so she could be closer to her mother and sister. In keeping with Della’s wishes, a private family service will be held. If you would like to honour Della, enjoy a chocolate bar with no guilt, or a bowl of wonton soup and a piece of pie with a rye (neat) on the side, and toast a life well lived. Arrangements are entrusted to Moose Jaw Funeral Home, 268 Mulberry Lane. Michelle Surtees Funeral Director 306-693-4550. Rest easy Della … was my pleasure too look after Della at Extendicare.. she was such a lovely beautiful soul .. I will sure miss you. My condolences too her family. Thank you for your kind words. Della was indeed a remarkable lady. And also, thank you and the rest of the wonderful people at Extendicare for taking such good care of Aunt Dell. It was sad news to hear that Mrs. Webberg had died, it also was nice to hear that she live up 98. My wife and I like to express our sympathy to family, and leave with you the comforting words of hope that is open for our dear ones, as mention Revelation 21: 1 – 4.